Takapala Waterfall has 109 meters high with huge volume of water that pour out daily, and becomes bigger during rainy season. The outpouring of water that hit the big chunks of rocks in the bottom causing a roar and a splash of water that forms a thin haze as far as 20 m.
Not far from Takapala there are also other waterfall names Ketemu Jodoh Waterfall; the name of Ketemu Jodoh means meeting a soulmate. The location of the waterfall is only separated by a road that leading to the village of Majannang, District Parigi. According to the people around the waterfall this waterfall believed to provide convenience for everyone who comes to bathe while intending to get a mate for marriage. 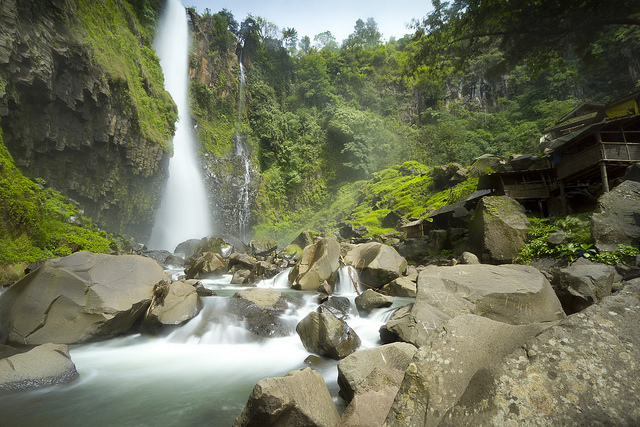 Takapala waterfall is located in the village of Bulutana, District Tinggimoncong, Gowa regency, South Sulawesi Province, it lies around 70 km from Makassar and it takes about 1 hour drive or 6 km from the town of Malino, the capital district of Tinggimoncong. The road to the waterfall is relatively good with a little winding up and down hills, just a few points’ encountered potholes. Along the way we will pampered by the pretty sight with one of the road side that indicating a bottomless.